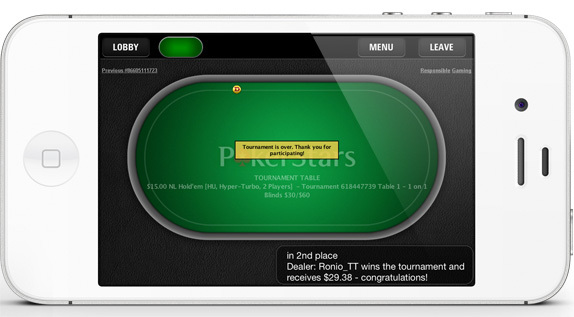 PokerStars released their real money iPhone app a while back and I’ve tried it out a couple of times, but never for a longer period of time. 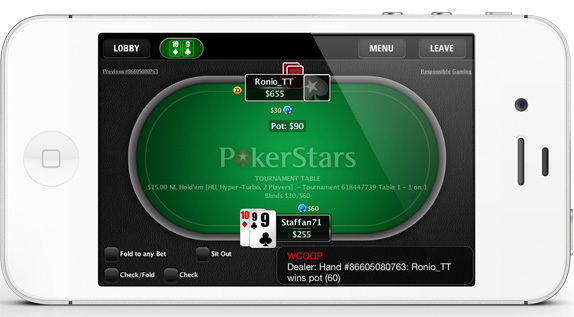 This weekend I played poker using it at different locations, at the skatepark while my kids were skateboarding and sitting on the couch watching TV, and for a longer period of time. 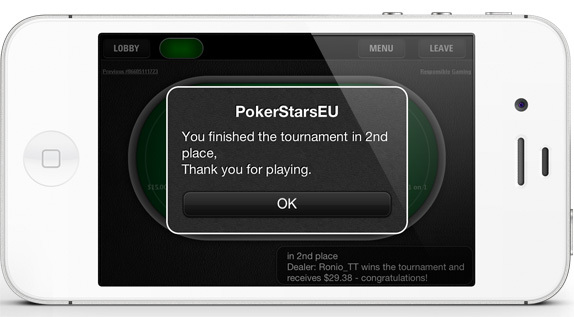 When you use the PokerStars iPhone app more you notice the little annoying things that could be improved to increase the player experience even more. I’ll cover two areas that I believe should be improved (get in touch if you want to know other areas I believe should be improved, staffan.schroder@inuse.se). 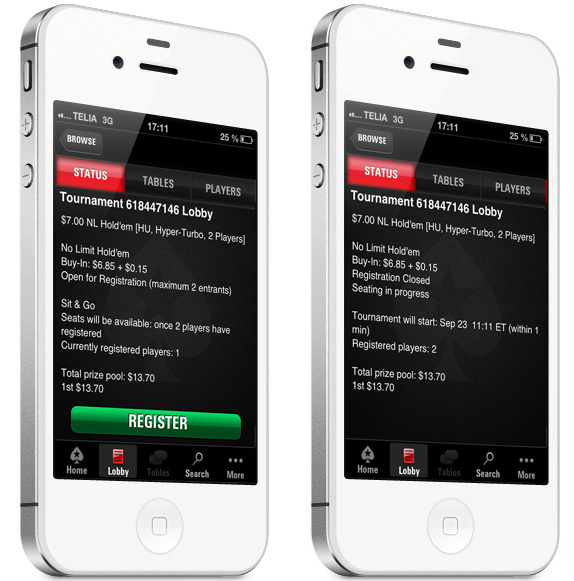 The first thing that can be improved is the tournament registration process which needs to be fast but often is not. It is kind of frustrating to select a tournament in image 1 and then when you tap on the register button in image 2 you get an alert saying that the tournament is full. When you go back it looks like in image 3 where the only thing you can do is to go back to the tournament lobby. My recommendation is to make it work like it does in the download client. There you can choose to register for any tournament with the chosen settings. Image 2. The registration Image 3. Tournament is closed. It gets tiring when you have been playing for a while on the iPhone app. The main reason for this is that the text is really small and you have to focus a lot to be able to read it. The action buttons are also too small making them harder to tap on. My recommendation: Increase the font size and make the buttons better so that it is easier to play while you do something else, i.e. in my case keeping an eye on the kids or watching tv at the same time as playing poker. Image 5. After a tournament is finished. Image 6. After tapping the OK button. When you finished a tournament you get an alert saying “…Thank you for playing” with the only action available is to tap the OK button to close the alert. When you do you get back to the table where PokerStars doesn’t give you any primary action, instead you just see the table view and can just go back to the lobby. My recommendation: Give the player the option to register for the same kind of tournament again. Overall the app works well but with a few minor changes could work perfectly!